After major rainstorms, Pine Creek outside of Halfway, Oregon, floods surrounding farmland and threatens nearby homesteads and sewage holding lagoons. 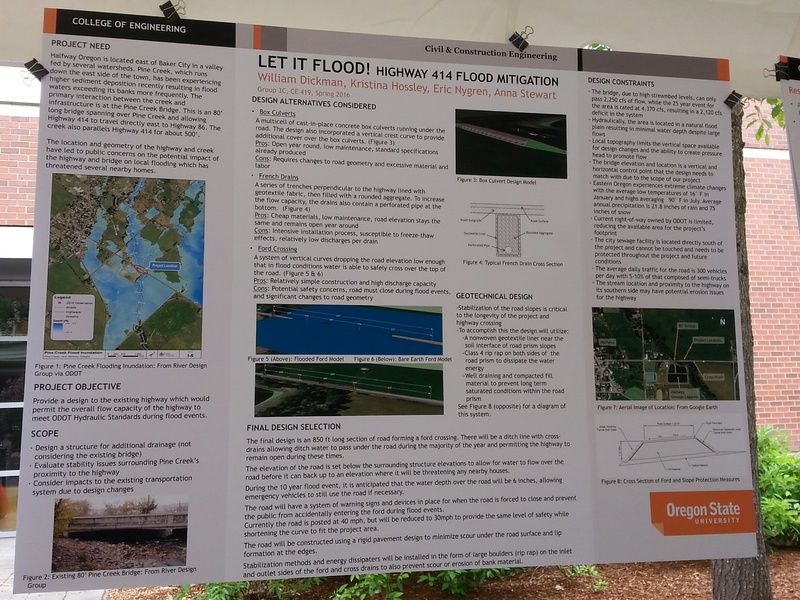 Will Dickman and his fellow Expo team members considered several possible solutions to mitigate the flooding and presented their recommendations to the Oregon Department of Transportation. 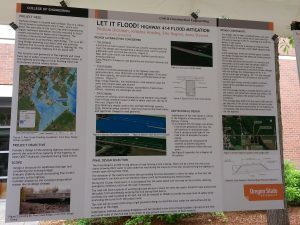 The major cause of flooding is the 80-foot-long Highway 414 bridge over the creek, according to Dickman, who is receiving a degree in civil engineering this year. “The bridge severely restricts the creek’s flow and leads to much higher flooding than would occur if the bridge wasn’t there,” he explained. If the overflow reached the sewage lagoons, he added, the resulting pollution would damage the environment and threaten endangered fish that live in the stream. The team evaluated three options: box culverts, French drains, and a ford crossing. Installing box culverts under the road would allow water to drain more quickly from flooded fields back into the creek, but the future engineers determined that the scope and cost of such a project was too large. A series of French drains — gravel-filled trenches containing a perforated drain pipe — running perpendicular to the highway would open new routes for floodwaters to return to the streambed. The team determined, however, that an excessively high number of drains would be needed to markedly increase the flow. French drains are also susceptible to breaking from repeated freezing and thawing. They’re also uncommon in Oregon, so installation and maintenance would require high-cost specialized contractors. The group favored a ford crossing. By lowering a section of the roadway just downstream of the creek, where it runs parallel to the roadway for a while, ODOT could create an 850-foot-long ford. When the creek floods, the excess water would flow over the roadway, but the maximum depth would reach no higher than six inches in all but the worst storms — low enough to allow safe passage of emergency vehicles. A system of warning signs and devices would be installed to prevent the public from accidentally entering the ford during flood events.